The Honors in Savannah Internship Program places one intern each summer in the U.S. Attorney's Office for the Southern District of Georgia. Interns are expected to work an average of 40 hours a week for a minimum of nine weeks, and are provided a substantial stipend to help offset living expenses. Only second- and third-year (based on date of enrollment) Honors students are eligible to apply. For more information, contact Maria de Rocher in the Honors Program. 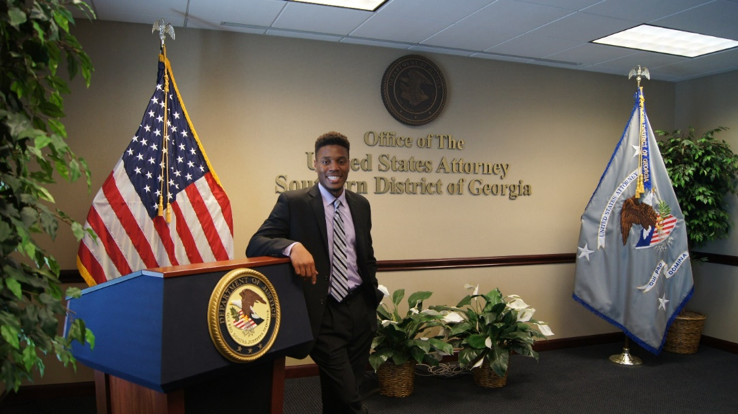 Bryant Anthony '17 (pictured above) "This was the greatest internship experience I could have ever had, and I wholehearted appreciate the Honors Program and the U.S. Attorney's Office for the Southern District of Georgia for giving me this incredible opportunity and experience." Allison Bailey ‘14 "Applying to the Honors Internship in Savannah program was perhaps the soundest decision I ever made. Nowhere else can an undergraduate find this sort of opportunity. Before I went to Savannah for my Honors Internship, I had never seen the criminal justice system in action. I knew and loved the theory of the law, but had never seen it in application. I had never witnessed firsthand the intersection of the law and law enforcement. Thanks to this internship, I now know what goal I am working towards, and what I want to do with my career." Download the Honors Internship Application.